At first, scientists thought that sand blown in from Arabia might be responsible. 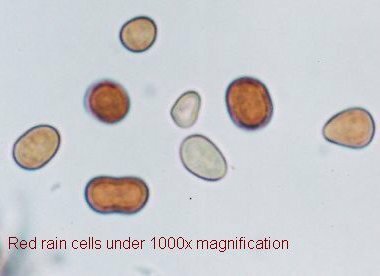 But microscopic examination of the red particles in the rain, by Indian government scientists and also, independently, by Godfrey Louis and his research student A. Santhosh Kumara at Mahatma Gandhi University (Kottayam, Kerala), showed that they were definitely not sand grains. They more closely resembled cells and appeared to be biological in origin. They were composed of 50% carbon, 45% oxygen, plus smaller amounts of other elements. Further examination of the red rain particles using optical and electron microscopes has not yet resolved the mystery. At Sheffield University, England, microbiologist Milton Wainwright and his colleagues have confirmed the cell-like appearance and have reported finding DNA using fluorescent stains such as DAPI. Despite this, researchers at Cardiff University, Wales, led by Chandra Wickramasinghe have been unable to extract and amplify DNA from the particles. Wickramasinghe is convinced that the "cells" are biological but of an unfamiliar nature. 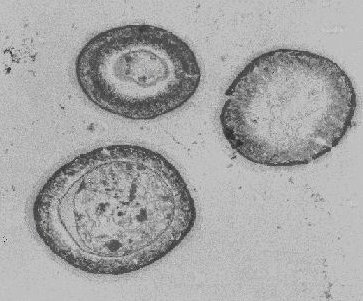 The three cells shown here are about 3 micrometers in diameter, with thick cell walls and a variety of nanostructures within a membrane, but with no identifiable nucleus. Image: © Cardiff Centre for Astrobiology, Cardiff University. 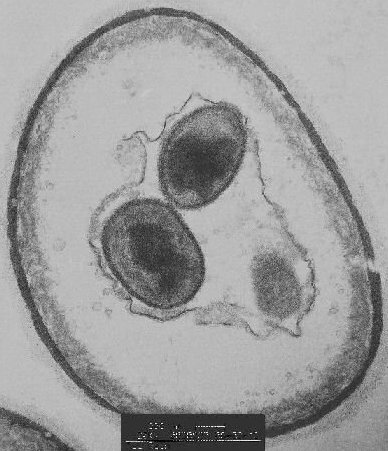 This picture shows a single cell with a shrunken membrane containing what appear to be 'daughters' cells. Two of the daughters have well-defined cell walls while the third structure may be a further daughter in the process of development. Oddly, it does look like a classic "alien" face! Wickramasinghe also claims to have found DNA in the cells but says this needs to be confirmed. 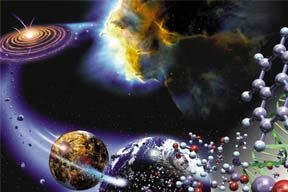 Image: © Cardiff Centre for Astrobiology, Cardiff University. So, was the red rain of Kerala extraterrestrial? Most scientists remain skeptical although they don't rule out the possibility. No one has yet come up with a water-tight counter-explanation for the strange cells. Meanwhile, those in favor of the "alien" hypothesis say it offers strong evidence for the theory of panspermia – that life can be seeded on worlds from space. A paper by Louis and Kumara1 was published in 2006 in the peer-reviewed journal Astrophysics and Space Science. 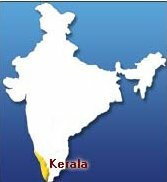 Shown below is the southern Indian state of Kerala where in July–September 2001 a strange red rain fell over a period of several weeks. The rain began on July 25 following reports of a bright flash and boom. 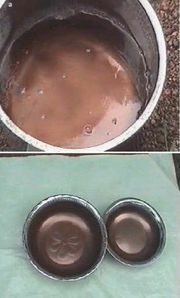 The first red rain fell in the districts of Kottayam and Idukki in the southern part of the state. Other colors, including yellow, green, and black rains were reported. Many occurrences of the colored rain were witnessed over the first 10 days of the phenomenon, followed by less frequent downpours until late September. The coloration of the rain was due to particles in suspension in the rain water. At times the collected water was as red as blood. Typically it fell in very localized areas, no more than a few square kilometers, and for about 20 minutes per shower. 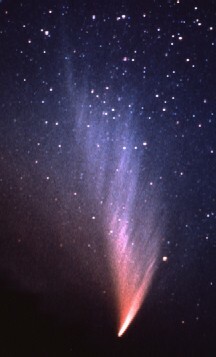 Coupled with the report of a flash and boom which may have come from a meteorite, the appearance of the "cells" led Louis to suggest that the red rain was extraterrestrial in origin. He suggested that the red material came from a comet, a piece of which broke off and entered the Earth's atmosphere before streaking across the skies of southern India, seeding the clouds above Kerala with the enigmatic particles. The official government investigation concluded the redness was caused by algal spores that had somehow been swept up into the atmosphere. A study2 by doctoral student Patrick McCafferty, of Queen's University Belfast, suggests the claimed connection between red rain and extraterrestrial life may be consistent with historical accounts linking colored rain to meteor events. McCafferty analyzed "80 accounts of red rain, another 20 references to lakes and rivers turning blood-red, and 68 examples of other phenomena such as colored rain, black rain, milk, bricks, or honey falling from the sky." Sixty of these events, or 36 percent, "were linked to meteoritic or cometary activity." However the connection was not always strong. Sometimes, "the fall of red rain seems to have occurred after an airburst," as from a meteor bursting apart; other times the phenomenon "is merely recorded in the same year as a stone-fall or the appearance of a comet." The events were recorded in times and places as varied as ancient Rome, medieval Ireland, Norman Britain, and nineteenth century California; McCafferty added that tales suggestive of red rain-meteor links also crop up in myth. "Without conclusive evidence such as meteoritic dust mixed with red rain, it is difficult to say anything specific about Kerala's red rain," McCafferty wrote. But in history, he added, "there appears to be a strong link between some reported events [like it] and meteoritic activity. The reported airburst just before the fall of red rain in Kerala fits a familiar pattern, and cannot be dismissed so easily as an unrelated coincidence." In their book The Cycle of Cosmic Catastrophes,3 Richard Firestone, Allen West, Simon Warwick-Smith refer (pp. 308-309) to an Incan legend which describes a sticky blood rain falling from the sky and covering everything. This was part of the destructive forces of nature that immersed the Inca city that is now at the bottom of Lake Titicaca. 1. Godfrey, Louis & A. Santhosh Kumar. "The Red Rain Phenomenon of Kerala and its Possible Extraterrestrial Origin." Astrophysics and Space Science, Vol. 302, No. 1-4. (2006), pp. 175-187. 2. McCafferty, P. "Bloody rain again! Red rain and meteors in history and myth." International Journal of Astrobiology, accepted June 13, 2007. 3. Firestone, R. B. West, A., and Warwick-Smith, S. The Cycle of Cosmic Catastrophes. Rochester, VT, Bear & Co., 2006.